A geriatrician who specializes in the care of older adults with complex medical issues, Dr. Samuel Durso has been recognized nationally and internationally for clinical and teaching excellence. In 1999, he received the Clinician of the Year Award from the American Geriatrics Society, and in 2009 the American Geriatrics Society honored him with the Dennis W. Jahnigen Award for national leadership in geriatric medical education. He is the author of Teaching Ambulatory Medicine (Johns Hopkins Press, 2002) and the principal editor for the American Oxford Handbook of Geriatric Medicine (Oxford University Press, 2010). 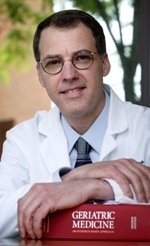 Dr. Durso is the Mason F. Lord Professor of Medicine and director of the Division of Geriatric Medicine and Gerontology at the Johns Hopkins University School of Medicine. He earned his medical degree with honors at Baylor College of Medicine in 1978 and his M.B.A. at the Johns Hopkins University Carey School of Business Following his residency in internal medicine at the University of Alabama Teaching Hospitals in Birmingham, he practiced for 14 years in Columbia, South Carolina, where he helped found the Columbia Free Medical Clinic.